Petition the Chinese government to stop the Yulin dog eating festival and pass animal welfare laws. On the 21st of June, the Yulin Dog Meat Eating Festival will take place in the Guangxi province of China. 15 000 dogs are slaughtered at this festival every year. Many of the dogs are reportedly abducted from their owner's homes and arrive in trucks at the festival with their collars still on. The dogs are skinned and boiled alive. Some are hung upside down and beaten then left to bleed out slowly. They are killed in front of other dogs, all in an attempt to increase the adrenaline in their muscles which the misguided believe will increase their virility when eaten. This is just one example of the horrors inflicted on animals in China every day. Dogs are treated like this and eaten year round. Bears are kept for their whole lives in cages too small to turn around in, and their bile milked from infected openings cut into their stomach. Turtles are sealed into little bags and sold as living key chains. Domestic pets and livestock are kept in appalling conditions at markets. Live chickens, turtles, quails and other birds and animals are shoved into net bags and left in the sun on the sidewalk without food and water until they are sold. Cats are boiled alive and eaten. The Chinese government must stop the Yulin dog eating festival. They must pass laws that will ensure that animals - whatever the species - are bred, held and killed in a humane and sustainable way. They must make animal abuse a criminal offense. Young Chinese activists are starting to take a stand and demanding change from their own government (Chinese driven petitions: http://chn.ge/134YzSe and http://1.usa.gov/18tt5Hp). They are fighting for animal rights at great personal and financial expense. Avaaz is just one of the internet sites blocked in China and makes their plight so much harder to get out to the world. Please stand with them and work for change in China's animal welfare laws. 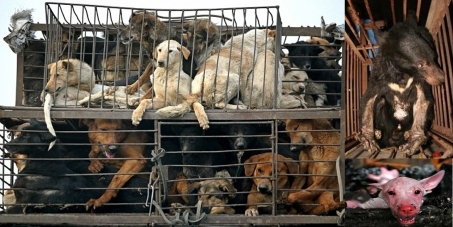 Update 23/6/2013: Despite widespread outrage from both within China, as well as the rest of the world, the Yulin festival went ahead as planned this year. The good news is that the Chinese government has started taking note of activist's concerns and dispatched officials to Yulin in an attempt to control the torture of these dogs prior to being slaughtered. Keep the pressure up. Sign petitions. Make your voice heard and don't stop until China passes animal welfare laws! Update 14/2/2014: 2800 cats - many of them pets with collars on - are rescued when activists stop a truck transporting the animals in Wuhan, China. Update 6/5/2014: China has passed laws to protect 420 endangered species by outlawing the consumption of these animal products. This is a huge step in the right direction! It remains to be seen whether the law is enforced, but change is slowly coming. Update 10/6/2014: Chinese activists have intercepted and detained a truck in Kunming transporting dogs to Yulin.